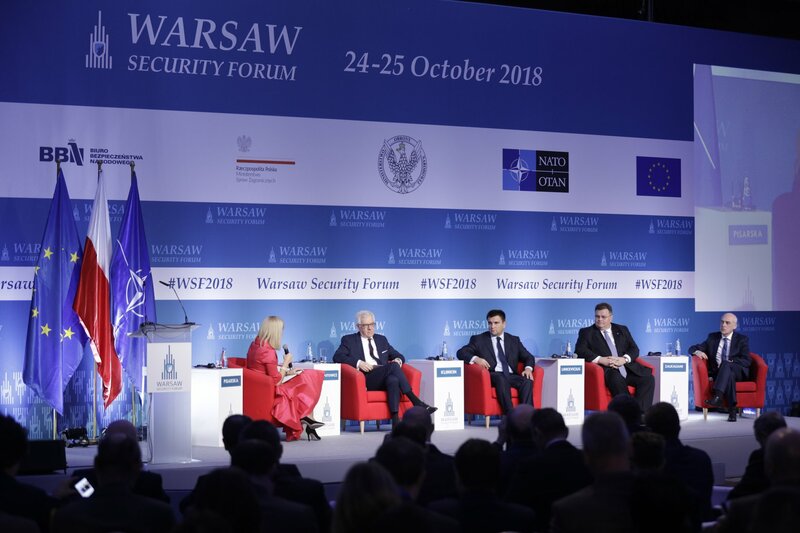 State of the transatlantic relations, future of NATO, place of Central and Eastern Europe within the global security architecture – are just a few of issues touched upon during this year’s Warsaw Security Forum, which took place on October 24 and 25, 2018. Participating in the Conference were over 20 former and current heads of states, prime ministers and ministers of Foreign Affairs and Defence from around the world, as well as over 1200 experts, representatives of governments, armed forces and high level representatives of business and industry. This year’s Warsaw Security Forum was organized with three numbers in mind – 5, 15 and 100, with each underscoring an overarching theme of the 2018 WSF Conference: it has been five years since the inaugural edition of the WSF took place; 15 years since the Casimir Pulaski Foundation, organizer of the Conference has been established and lastly, 100 years ago Poland has regained its independence. Throughout two days of the Conference, the participants had the opportunity to participate in over 20 plenary session, presentations and a host of accompanying events – seminars, working sessions, and decision making exercises. Innovation corner, a new format called Innovation corner was introduced this year, devoted to issues, inter alia, of cybersecurity, energy security and defence. A speech by the chairman of the Casimir Pulaski Foundation, Mr. Zbigniew Pisarski inaugurated the Conference. Mr Pisarski’s address was followed by remarks of Mr. Paweł Soloch, Head of Poland’s National Security Bureau, who noted that only a well-coordinated and close cooperation between the US and the European states can ensure a stable and secure environment on the European Continent. Two ministerial sessions were held during the Conference. The first of those gathered Ministers of Foreign Affairs from Poland, Ukraine, Lithuania and Georgia. Foreign Affairs Minister of Ukraine Pavlo Klimkin noted, that Europe needs a more proactive approach towards threats emanating from Russia, and an increased focus on transatlantic solidarity. His Lithuanian counterpart, Linas Linkevicius remarked that the European values are rendered meaningless unless they are cherished and protected. Minister of Foreign Affairs of Georgia, David Zalkaliani noted, that the process of European Integration bears great promise, by providing a blueprint of strong democratic institutions, which serve as a bulwark against human rights violations and help eradicate corruption. Minister of Foreign Affairs of Poland, Mr. Jacek Czaputowicz suggested, that stakeholders should take further steps towards facilitating EU accession by the Eastern Partnership states. Minister Czaputowicz has also commented on the importance of transatlantic solidarity, remarking that division within the Alliance will have a detrimental effect on Poland. “Poland participates in those debates. We show solidarity towards our European partners, but at the same time we are cognizant of the US perspective on threats and challenges to global security” – remarked Minister Czaputowicz. Following the first ministerial session an informal interlude took place; a Polish-Lithuanian racing duo Benediktas Vanagas and Sebastian Rozwadowski, who will be competing in this years Dakar Rally presented their new car – Gazoo Racing Toyota Hilux. Both drivers racing overalls boasted coats of arms of Poland and Lithuania – the White Eagle and Pahonia. The following ministerial sessions gathered the Minister of Foreign Affairs of Albania Ditmir Bushati, Hungary – Peter Szijjarto, former Minister of Foreign Affairs of Sweden Carl Bildt, as well as Maciej Popowski, Deputy Director General of the European External Action Service. The discussion focused on the state of relations between the EU, and the Western Balkan States. Minister Dimitri Bushati underscored that we are currently witnessing prioritisation of EU enlargement by means of Rule of Law reforms in the Western Balkans. Head of the Hungarian MFA, Peter Szijjarto declared, that Hungary steadfastly supports all efforts geared towards facilitating a faster accession of Balkan States to NATO and the EU. The EEAS representative Maciej Popowski stated that retaining the dynamic of the Berlin Process is key to success – “we need to ensure that all of the member states are onboard”. “I am confident, that a successful peace process in the Balkans is the key to EU accession”, remarked Popowski. Carl Bildt appealed for an increased sense of unity and creating an international environment where a peaceful coexistence between peoples is attainable. The first day of the Warsaw Security Forum was marked by debates regarding the Transatlantic Alliance. A conversation entitled “The NATO Brussels Summit – what have we learned about the state of Alliance” was held, between Ben Hodges, the former US Army Europe Commanding General and Anders Fogh Rasmussen, NATO Secretary General (2009-2014). Rasmussen underscored, that NATO has emerged “stronger in the military sense, but weaker politically” following the Brussels Summit – a reference to the ongoing political friction within the transatlantic community. In spite of his growing concern caused by an increasingly aggressive Russian posturing, Anders Fogh Rasmussen expressed his hopes for a better and more amiable relations between the West and Russia in the future, and pointed out that NATO has never threatened Russia in the past, and will not do so in the future. Former General Secretary has likewise reaffirmed the need for a hightened NATO military presence on the Alliance’s Eastern flank, and has called for doubling down on the efforts aimed at countering terrorism. General Hodges expressed his belief that this year’s summit was fruitful, in spite of controversies related to Member States financial burden sharing. NATO retains its adaptive capacity in a difficult and rapidly changing environment. However, improvements can be made in regard to threats in the Baltic and Black Seas, where NATO needs to increase its coherence and show joint commitment in an even more pronounced fashion. Moreover, as Hodges pointed out, we should be cognizant of the fact that the last thing Russia wants is to be bordered by democratic liberal states. A session entitled „NATO defence and deterrence – what comes next for the eastern flank?”, moderated by Michał Kobosko, senior adviser of the Atlantic Council, is worth a separate mention. Among the panelists were Ian Brzeziński of the Atlantic Council, Claudia Major of the German Stiftung Wissenschaft und Politik, and Jamie Shea, former NATO Deputy Assistant Secretary General for Emerging Security Challenges, currently representing Brussel’s based Friends of Europe think tank. In the course of a vigorous discussion that ensued, Claudia Major remarked, that „we must all be aware of the uncertainty that may emerge if the decisions and policies of the governments are not accompanied by a sufficient communication strategy“, which she believes is true of the current US leadership. Referring to the current US administration Major further underscored the importance of differentiating between short term benefits and long term costs of certain actions. Jamie Shea stressed the great role of the United States in maintaining the smooth functioning of NATO: even if every European member state would spend 2% of its GDP on defense, the Alliance still ultimately depends on the US. Thus, the United States plays a key role in guaranteeing security of the entire European continent` and can not be replaced by any other country. In addition, Shea drew attention to the fact that NATO should be prepared and adapt its activities to possible hybrid threats and operations that could be conducted by the Russian Federation. Ian Brzeziński underscored, that with the beginning of the US military involvement in Syria Donald Trump has become the very first US President since the end of Cold War that actively engaged in a military action against an alliance of which Russia is a member. The first day of the Conference culminated in an official ceremony where the Knight of Freedom Award was presented to Anders Fogh Rasmussen. Knnight of Freedom is an accolade presented on an annual basis by the Casimir Pulaski Foundation to individuals who have provided an outstanding contribution to promoting values most important to General Casimir Pulaski – freedom, justice and democracy. Lithuanian Minister of Foreign Affairs, Mr Linas Linkevicius delivered the laudation. Day Two of the Conference. The second day of the Warsaw Security Forum opened with a speech delivered by the Polish Minister of Investment and Development Jerzy Kwieciński who noted that the subject matter of security in too often forgotten within the EU. Today — according to the minister – issue of security, both in its internal and external dimension should be prioritised by the next EU financial perspective. Poland is one of the countries that believes security should be placed at the top of the list of EU priorities. In an interview with Dominika Ćanto, Minister Kwieciński emphasised that security is a basic requirement for the stable and robust functioning of the EU in te future. In an interview with Dominika Ćanto, Minister Kwieciński emphasised that ensuring a secure domestic and international environment free of immediate threats is a basic requirement for the future of the European Union. “If we do not guarantee it, we will end up in a very perilous situation” – stressed Kwieciński. In his speech, Fabrice Leggeri, who is the executive director of Frontex, conceeded that the European Union should assess its ability to ensure the safety of its members states. “The EU’s common external border is only as strong as its weakest link, and the Schengen area can only exist as long as there are no weak links” – he noted. A final session of the 2018 Warsaw Security Forum was the plenary discussion entitled „Russia and the West: if it’s not a cold war, that what is it?” with participation of the head of the US-Russia Foundation Celeste Wallander, the NATO senior officer Robert Pszczel, an independent analyst Bob Lo, a member of the Russian Duma Ilya Ponomarev and former Lithuanian Foreign Minister Vygaudas Usackas. The session’s moderator was Brian Whitmore of the Center for European Policy Analysis. Bobo Lo noted that the bipolar division into Russia and the West is fundamental in nature and can still lead to violent military conflicts. Bob Lo further stated, that “when it comes to politics, if we do not fix ourselves, we have no moral grounds to try and dictate to others how to fix themselves. This applies to both allies and adversaries, and in this particular case, Russia. “We, as members of the West, should be afraid of threats posed by Russia as well as China’s growing strength. Celeste Wallander said that it is the weakest, declining powers that are the most dangerous, because they usually are compelled to initiate conflict. The US-Russia Foundation director stated that the United States is unable to defeat either Russia or China without help of its allies, and above all without the NATO. These are just a few of over 20 panel discussions held during the 2018 WSF. It is important to remember, however that the WSF is not just engaging plenary sessions, but also a unique opportunity for networking and informal discussions. This year’s edition of the WSF also included three working meetings, including a “networking breakfast” for Women in International Security Poland (WIIS Poland). Warsaw Security Forum was also supplemented by nearly 20 conversations held in the “Round Table” format, on, among others, Russia-China relations or the future of Central and Eastern Europe. Behind the scenes of the conference a meeting was held for the chairmen of parliamentary defence committees, led by Mr Michał Jach of Poland’s Parliamentary Committee on National Defence. We would like to take this opportunity to invite you to join us in Warsaw next year for the 2019 edition of the Warsaw Security Forum! Before then, please make sure to enjoy the video recordings of all the plenary and break-out sessions, which we will publish shortly.